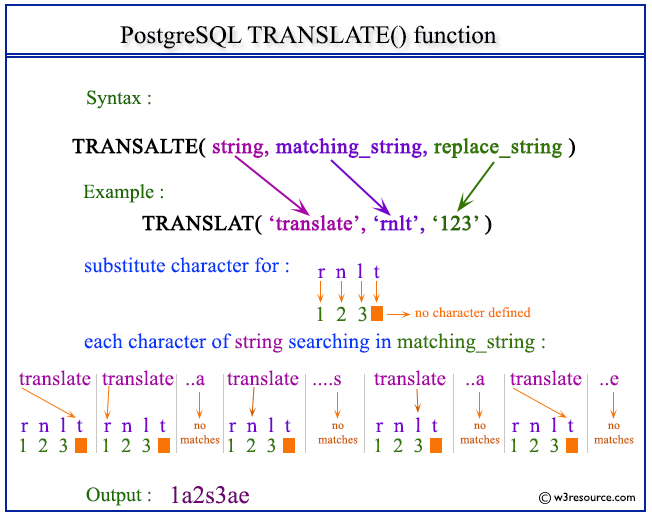 The PostgreSQL translate() function is used to translate any character in the string by a character in replace_string. The characters in replace_string are corresponding to the characters in matching_string. The translate will happen when any character in the string matching with the character in the matching_string. In the above example, the each character in the first parameter is searching in the second parameter and replacing by the substitute character from the third parameter. Here 't' found in the fourth place in the second parameter and no substitute character defined for this place, so no translate will take place. The second character 'r' is matching with the first character of 'rnlt' and translate with '1'. Thus 'a' is not matching and no translate have done, 'n' is matching and translate with '2', 's' is not matching and no translate have done, 'l' is matching and translate with '3', 'a' is not matching and no translate have done, 't' is matching but no substitute character defined, so no translate will take place, 'e' is not matching and no translate have done. In the above example, the each character in the first parameter is searching in the second parameter and replacing by the substitute character from the third parameter. Here 't' found in the fourth place in the second parameter and matching with the forth character of 'rnlt' and translate with '4'. The second character 'r' is matching with the first character of 'rnlt' and translate with '1'. Thus 'a' is not matching and no translate have done, 'n' is matching and translate with '2', 's' is not matching and no translate have done, 'l' is matching and translate with '3', 'a' is not matching and no translate have done, 't' is matching and translate with '4', 'e' is not matching and no translate have done.